Combat the effects of age on your vision. Rogisen is the once-daily caplet to help prevent macular degeneration and support improved night vision. Rogisen consists of a proprietary blend of key vitamins, minerals, and other natural ingredients. These elements are carefully balanced to deliver the maximum benefit for supporting improved night vision and general ocular health. The human eye is one of the most important organs in the body. When healthy, the eye provides a wide range of vision, allowing us to see in bright sunlight or on dark nights. But as we age, our range of vision is typically reduced. Usually, the first symptom of this is trouble seeing at night. Other age-related problems may include macular degeneration, the leading cause of blindness in the United States. Ingredients in Rogisen have been shown to help reduce the risk of macular degeneration, supply nutrients essential for healthy vision, and help protect eyes from UV damage. Vision problems and night blindness can be symptoms of a more serious medical condition. Consult your doctor if you experience sudden or severe vision loss, or if you have any other symptoms that may indicate ocular disease. Rogisen contains no known harmful ingredients. The contents of Rogisen are a premium blend of high-quality natural ingredients specially formulated to help improve night vision and general ocular health. As with any supplements, if you are experiencing health problems of any kind you should consult your physician before use. 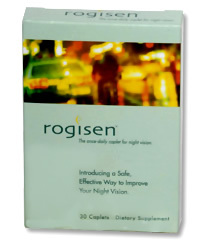 For better night vision and ocular health naturally, try Rogisen.